On the evening of Friday, August 16th, the years'-long effort to save the La Casita library at Whittier Elementary School in Chicago's Pilsen neighborhood took a turn for the worse. 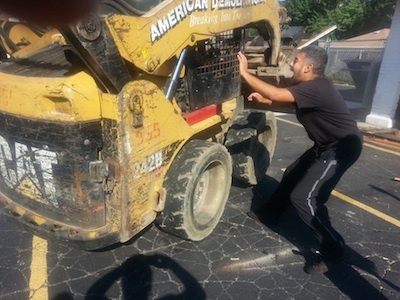 With no advance notice, Chicago Public Schools authorities brought demolition equipment and a demolition order to destroy the library. Parents and community members staged an emergency blockade, which forced crews to depart for the night. Library supporters maintained the blockade overnight. But on the morning of Saturday, August 17th, CPS and demolition crews returned, flanked by Chicago police. A bulldozer eluded the blockade by destroying part of the surrounding fence away from defenders, opening a direct path to the library. Defenders stormed the facility once the fence was broken, but all of the defenders present at the time -- about a dozen in all -- were placed under arrest while a bulldozer destroyed the library, to the heartbreaking screams of onlookers. Despite the destruction, the community immediately vowed to redouble their efforts. Jail solidarity efforts were organized for those arrested in La Casita's defense, all of whom were released. Community members staged a vigil to mourn the destroyed fieldhouse, and called for a new center to replace La Casita. City officials claim that the demolition "had to happen" despite eyebrow-raising circumstances like an apparently invalid demolition permit and the sidestepping of standard procedure.